Interesting information from ISBA 8 sesions today, as seen on Twitter (see programme in PDF, and sessions from the 19th and the 20th september). 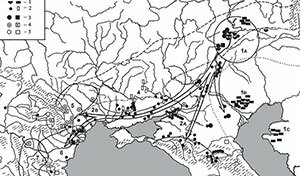 The long-held archaeological view sees the Early Iron Age nomadic Scythians expanding west from their Altai region homeland across the Eurasian Steppe until they reached the Ponto-Caspian region north of the Black and Caspian Seas by around 2,900 BP1. 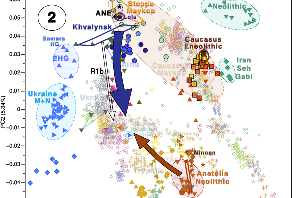 However, the migration theory has not found support from ancient DNA evidence, and it is still unclear how much of the Scythian dominance in the Eurasian Steppe was due to movements of people and how much reflected cultural diffusion and elite dominance. 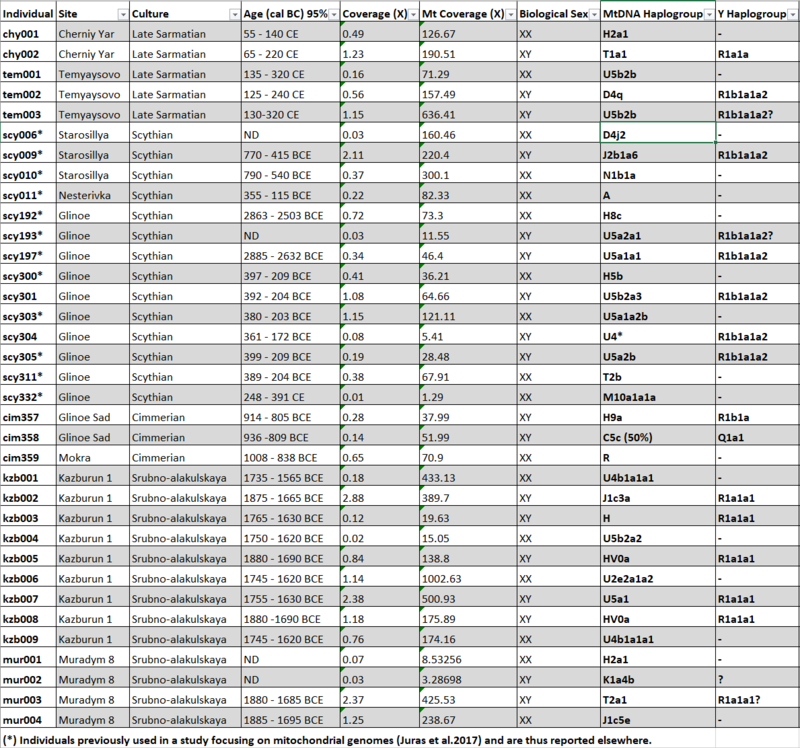 We present new whole-genome results of 31 ancient Western and Eastern Scythians as well as samples pre- and postdating them that allow us to set the Scythians in a temporal context by comparing the Western Scythians to samples before and after within the Ponto-Caspian region. We detect no significant contribution of the Scythians to the Early Iron Age Ponto-Caspian gene pool, inferring instead a genetic continuity in the western Eurasian Steppe that persisted from at least 4,800–4,400 cal BP to 2,700–2,100 cal BP (based on our radiocarbon dated samples), i.e. 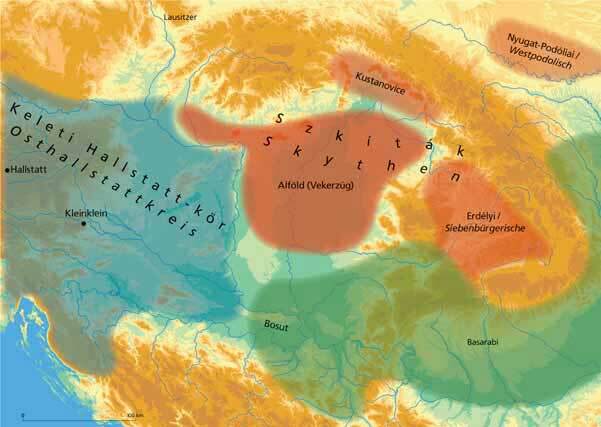 from the Yamnaya through the Scythian period. However, the transition from the Scythian to the Chernyakhov culture between 2,100 and 1,700 cal BP does mark a shift in the Ponto-Caspian genetic landscape, with various analyses showing that Chernyakhov culture samples share more drift and derived alleles with Bronze/Iron Age and modern Europeans, while the Scythians position outside modern European variation. Our results agree well with the Ostrogothic origins of the Chernyakhov culture and support the hypothesis that the Scythian dominance was cultural rather than achieved through population replacement. 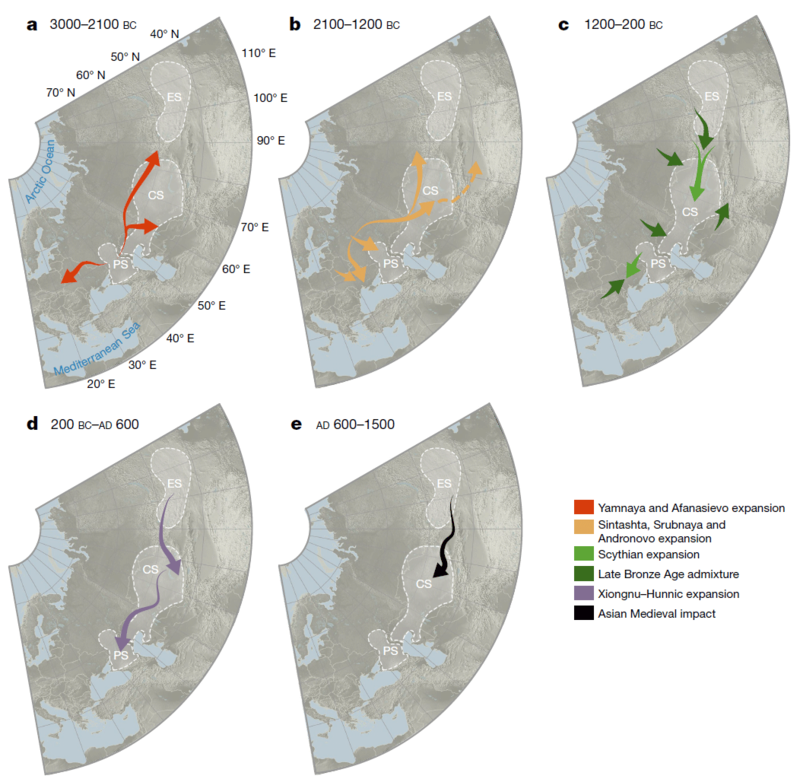 Interesting to read in combination with yesterday’s re-evaluation of Scythian mobility and settlement patterns in the west (showing adaptation to the different regional cultures), The Steppe was Sown – multi-isotopic research changes our understandings of Scythian diet and mobility, by Ventresca Miller et al. Nomadic pastoralists conventionally known as the Scythians occupied the Pontic steppe during the Iron Age, c. 700-200 BC, a period of unprecedented pan-regional interaction. Popular science accounts of the Scythians promote narratives of roving bands of nomadic warriors traversing the steppe from the Altai Mountains to the Black Sea coastline. The quantity and scale of mobility in the region is usually emphasized based on the wide distribution of material culture and the characterization of Iron Age subsistence economies in the Pontic steppe and forest-steppe as mobile pastoralism. 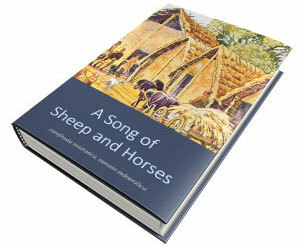 Yet, there remains a lack of systematic, direct analysis of the mobility of individuals and their animals. 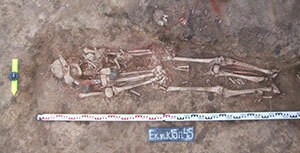 Here, we present a multi-isotopic analysis of humans from Iron Age Scythian sites in Ukraine. Mobility and dietary intake were documented through strontium, carbon and oxygen isotope analyses of tooth enamel. Our results provide direct evidence for mobility among populations in the steppe and forest-steppe zones, demonstrating a range of localized mobility strategies. However, we found that very few individuals came from outside of the broader vicinity of each site, often staying within a 90 km radius. Dietary intake varied at the intrasite level and was based in agro-pastoralism. While terrestrial protein did form a portion of the diet for some individuals, there were also high levels of a 13C-enriched food source among many individuals, which has been interpreted as millet consumption. Individuals exhibiting 87Sr/86Sr ratios that fell outside the local range were more likely to have lower rates of millet consumption than those that fell within the local range. This suggests that individuals moving to the site later in life had different economic pursuits and consumed less millet. There is also strong evidence that children and infants moved at the pan-regional scale. 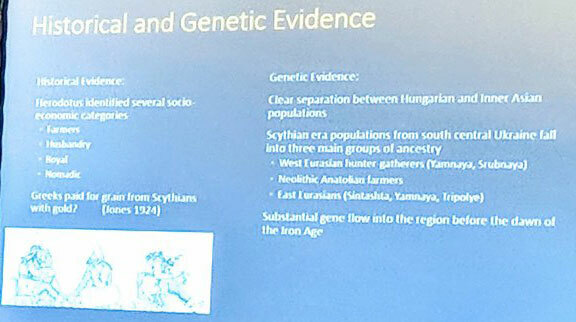 Contrary to the popular narrative, the majority of Scythians engaged in localized mobility as part of agricultural lifeways while pan-regional movements included family groups. 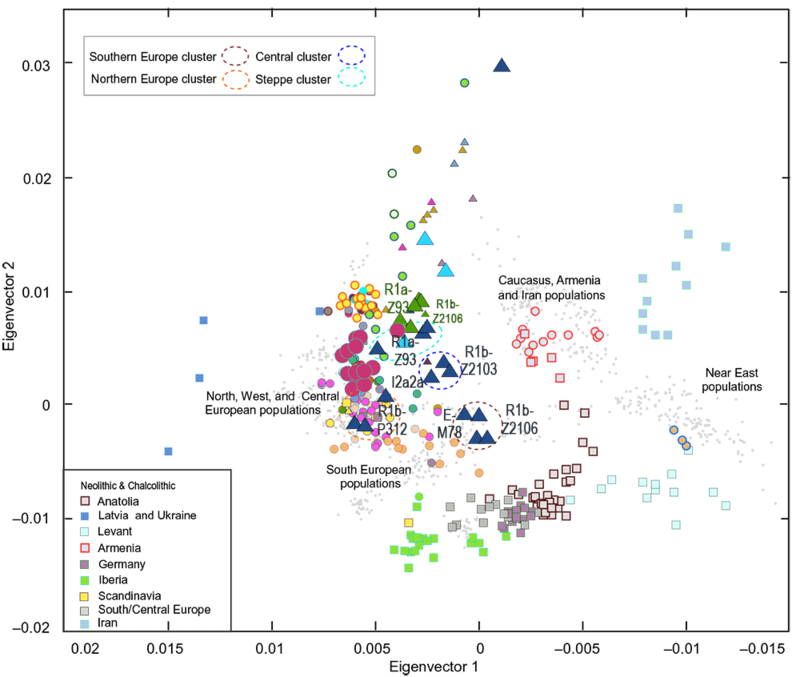 Pleistocene North Africans show dual genetic ancestry from the ancient Near East and sub-Saharan Africa, by van de Loosdrecht et al. North Africa, connecting sub-Saharan Africa and Eurasia, is important for understanding human history. 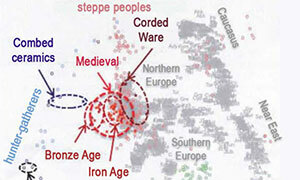 However, the genetic history of modern humans in this region is largely unknown before the introduction of agriculture. After the Last Glacial Maximum modern humans, associated with the Iberomaurusian culture, inhabited a wide area spanning from Morocco to Libya. The Iberomaurusian is part of the early Later Stone Age and characterized by a distinct microlithic bladelet technology, complex hunter-gathering and tooth evulsion. Here we present genomic data from seven individuals, directly dated to ~15,000-year-ago, from Grotte des Pigeons, Taforalt in Morocco. Uni-parental marker analyses show mitochondrial haplogroup U6a for six individuals and M1b for one individual, and Y-chromosome haplogroup E-M78 (E1b1b1a1) for males. We find a strong genetic affinity of the Taforalt individuals with ancient Near Easterners, best represented by ~12,000 year old Levantine Natufians, that made the transition from complex hunter-gathering to more sedentary food production. 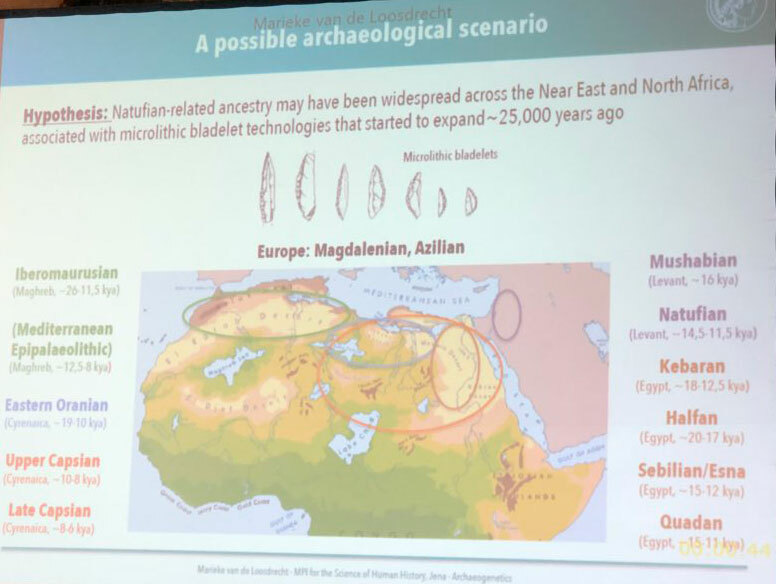 This suggests that genetic connections between Africa and the Near East predate the introduction of agriculture in North Africa by several millennia. Notably, we do not find evidence for gene flow from Paleolithic Europeans into the ~15,000 year old North Africans as previously suggested based on archaeological similarities. Finally, the Taforalt individuals derive one third of their ancestry from sub-Saharan Africans, best approximated by a mixture of genetic components preserved in present-day West Africans (Yoruba, Mende) and Africans from Tanzania (Hadza). In contrast, modern North Africans have a much smaller sub-Saharan African component with no apparent link to Hadza. Our results provide the earliest direct evidence for genetic interactions between modern humans across Africa and Eurasia. So, most likely, Natufian-related ancestry – as sub-Saharan ancestry – not related to the Afroasiatic expansion. NOTE. This now probably outdated already by the new preprint on Dzudzuana samples, from the Caucasus. 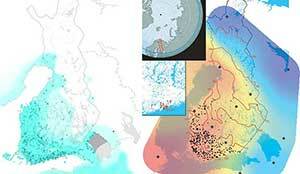 Exploring the genomic impact of colonization in north-eastern Siberia by Seguin-Orlando et al. Yakutia is the coldest region in the northern hemisphere, with winter record temperatures below minus 70°C. The ability of Yakut people to adapt both culturally and biologically to extremely cold temperatures has been key to their subsistence. They are believed to descend from an ancestral population, which left its original homeland in the Lake Baykal area following the Mongol expansion between the 13th and 15th centuries AD. They originally developed a semi-nomadic lifestyle, based on horse and cattle breeding, providing transportation, primary clothing material, meat, and milk. 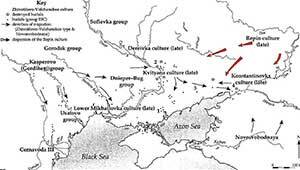 The early colonization by Russians in the first half of the 17th century AD, and their further expansion, have massively impacted indigenous populations. It led not only to massive epidemiological outbreaks, but also to an important dietary shift increasingly relying on carbohydrate-rich resources, and a profound lifestyle transition with the gradual conversion from Shamanism to Christianity and the establishment of new marriage customs. Leveraging an exceptional archaeological collection of more than a hundred of bodies excavated by MAFSO (Mission Archéologique Française en Sibérie Orientale) over the last 15 years and naturally kept frozen by the extreme cold temperatures of Yakutia, we have started to characterize the (epi)genome of indigenous individuals who lived from the 16th to the 20th century AD. Current data include the genome sequence of approximately 50 individuals that lived prior to and after Russian contact, at a coverage from 2 to 40 fold. Combined with data from archaeology and physical anthropology, as well as microbial DNA preserved in the specimens, our unique dataset is aimed at assessing the biological consequences of the social and biological changes undergone by the Yakut people following their neolithisation by Russian colons. Also interesting to read Balanovsky’s session, and a previous paper on the expansion of Yakuts. 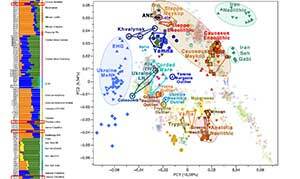 Maternal genetic features of the Iron Age Tagar population from Southern Siberia (1st millennium BC), by Pilipenko et al. (2018). 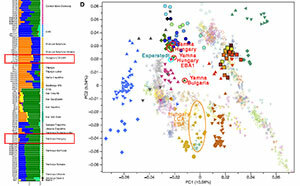 The positions of non-Tagar Iron Age groups in the MDS plot were correlated with their geographic position within the Eurasian steppe belt and with frequencies of Western and Eastern Eurasian mtDNA lineages in their gene pools. 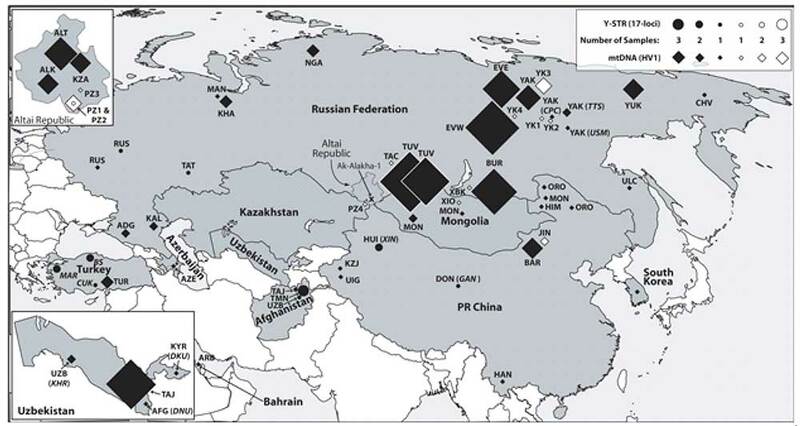 Series from chronological Tagar stages (similar to the overall Tagar series) were located within the genetic variability (in terms of mtDNA) of Scythian World nomadic groups (Figs 5 and 6; S4 and S6 Tables). Specifically, the Early Tagar series was more similar to western nomads (North Pontic Scythians), while the Middle Tagar was more similar to the Southern Siberian populations of the Scythian period. 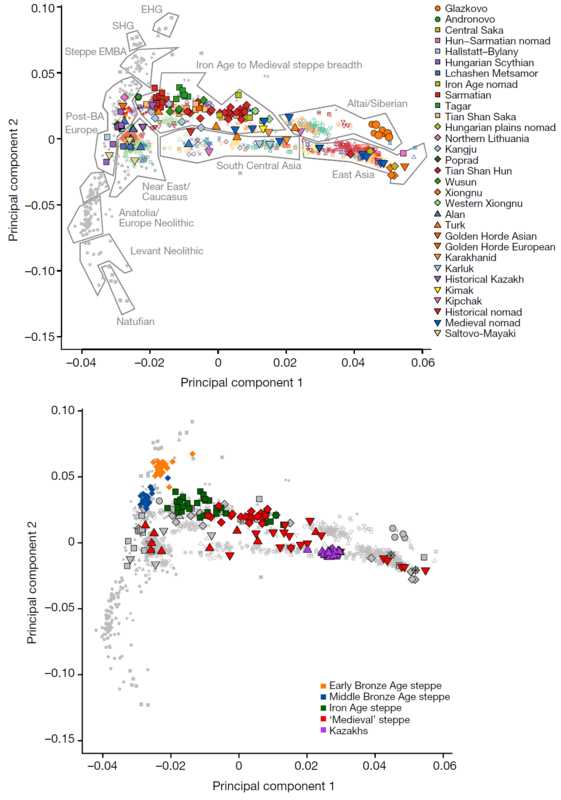 The Late Tagar group (Tes`culture) belonging to the Early Xiongnu period had the “western-most” location on the MDS plot with the maximal genetic difference from Xiongnu and other eastern nomadic groups (but see Discussion concerning the low sample size for the Tes`series). In a comparison of our Tagar series with modern populations in Eurasia, we detected similarity between the Tagar group and some modern Turkic-speaking populations (with the exception of the Indo-Iranian Tajik population) (Fig 7; S2 Table). 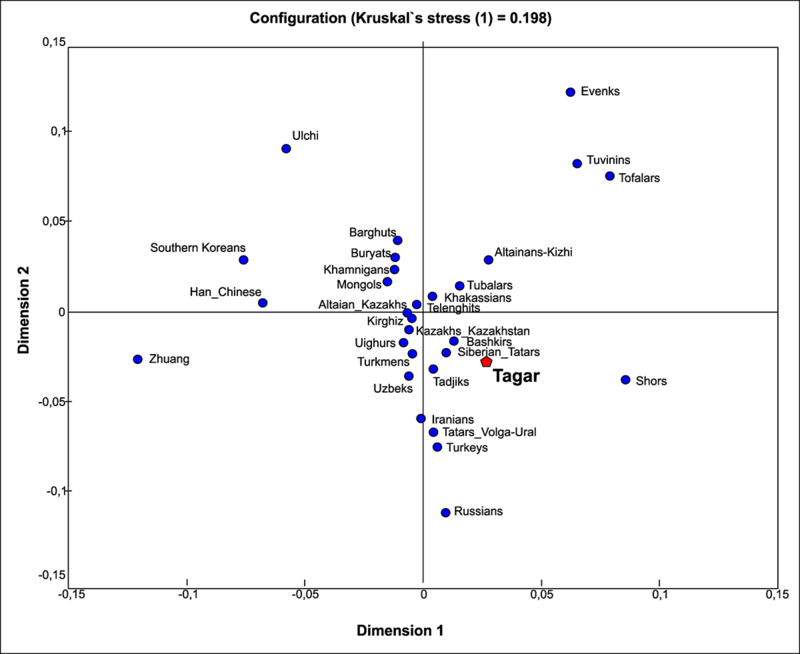 Among the modern Turkic-speaking groups, populations from the western part of the Eurasian steppe belt, such as Bashkirs from the Volga-Ural region and Siberian Tatars from the West Siberian forest-steppe zone, were more similar to the Tagar group than modern Turkic-speaking populations of the Altay-Sayan mountain system (including the Khakassians from the Minusinsk basin) (Fig 7). Our results are not inconsistent with the assumption of a probable role of gene flow due to the migration from Western Eurasia to the Minusinsk basin in the Bronze Age in the formation of the genetic composition of the Tagar population. 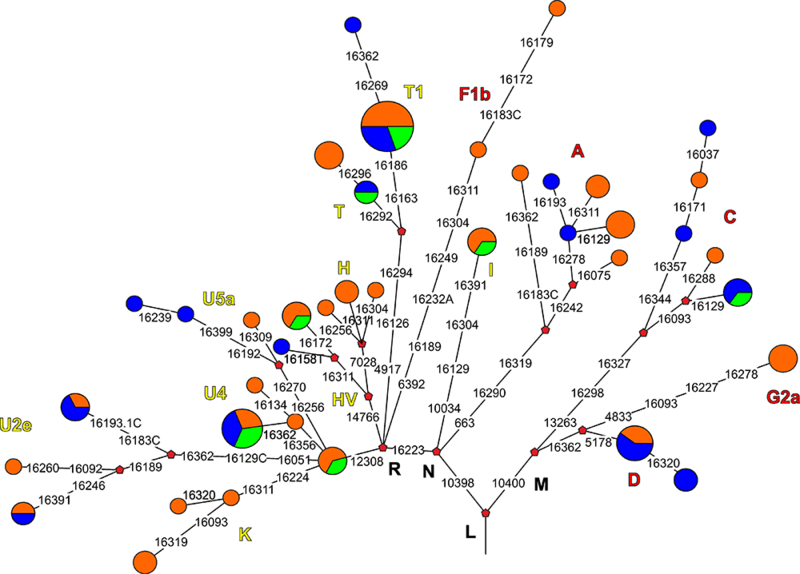 Particularly, we detected many mtDNA lineages/clusters with probable West Eurasian origin that were dominant in modern populations of different parts of Europe, Caucasus, and the Near East (such as K and HV6) in our Tagar series based on a phylogeographic analysis. We detected relatively low genetic distances between our Tagar population and two Bronze Age populations from the Minusinsk basin—the Okunevo culture population (pre-Andronovo Bronze Age) and Andronovo culture population, followed by Afanasievo population from the Minusinsk Basin and Middle Bronze Age population from the Mongolian Altai Mountains (the region adjacent to the Minusinsk basin) (Figs 3 and 6; S3 and S5 Tables). Among West Eurasian part of our Tagar series we also observed haplogroups/sub-haplogroups and haplotypes shared with Early and Middle Bronze Age populations from Minusinsk Basin and western part of Eurasian steppe belt (Fig 4; S5 Table). Thus, our results suggested a potentially significant role of the genetic components, introduced by migrants from Western Eurasia during the Bronze Age, in the formation of the genetic composition of the Tagar population. 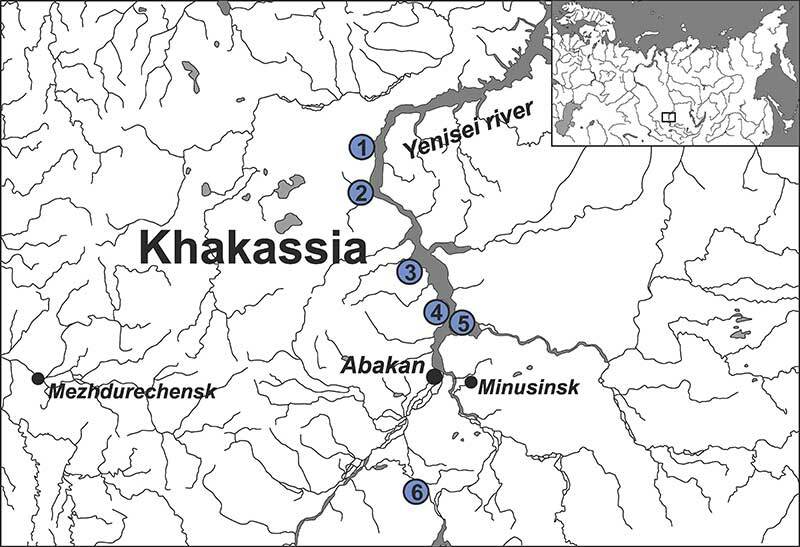 It is necessary to note the relatively small size of available mtDNA samples from the Bronze Age populations of Minusinsk basin; accordingly, additional mtDNA data for these populations are required to further confirm our inference. Another substantial part of the mtDNA pool of the Tagar and other eastern populations of the Scythian World is typical of populations in Southern Siberia and adjacent regions of Central Asia (autochthonous Central Asian mtDNA clusters). Most of these components belong to the East Eurasian cluster of mtDNA haplogroups. Moreover, the role of each of these components in the formation of the genetic composition of subsequent (to the present) populations in South Siberia and Central Asia could be very different. In this regard, cluster C4a2a (and its subcluster C4a2a1), and haplogroup A8 are of particular interest. We compared successive Tagar groups (Early, Middle, and Late Tagar) with each other and with other Iron Age nomadic populations to evaluate changes in the mtDNA pool structure. 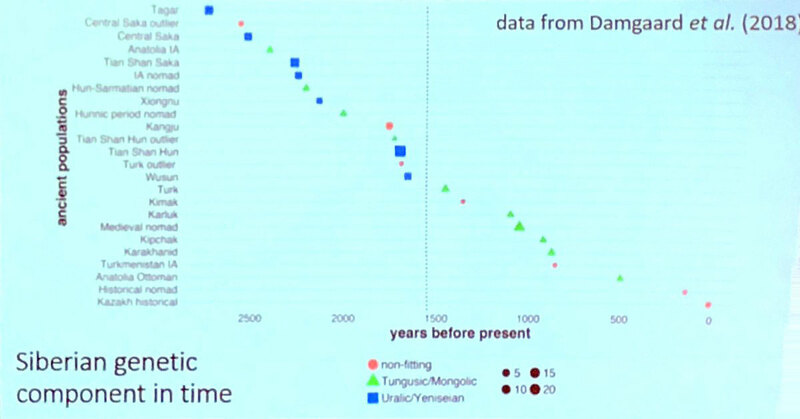 Despite the genetic similarity between the Early and Middle Tagar series and Scythian World nomadic groups (Figs 5 and 6; S4 and S6 Tables), there were some peculiarities. For example, the Early Tagar series was more similar to North Pontic Classic Scythians, while the Middle Tagar samples were more similar to the Southern Siberian populations of the Scythian period (i.e., completely synchronous populations of regions neighboring the Minusinsk basin, such as the Pazyryk population from the Altay Mountains and Aldy-Bel population from Tuva). We observed differences in the mtDNA pool structure between the Early and the Middle chronological stages of the Tagar culture population, as evidenced by the change in the ratio of Western to Eastern Eurasian mtDNA components. 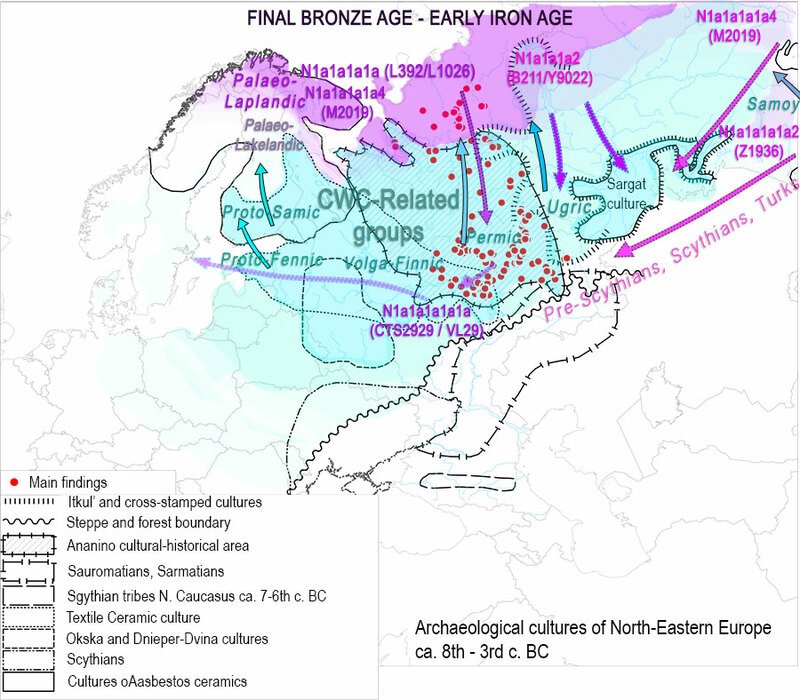 The contribution of Eastern Eurasian lineages increased from about one-third (34.8%) in the Early Tagar group to almost one-half (45.8%) in the Middle Tagar group. At the level of mtDNA haplogroups, we detected a decrease in the diversity of phylogenetic clusters during the transition from the Early Tagar to the Middle Tagar. 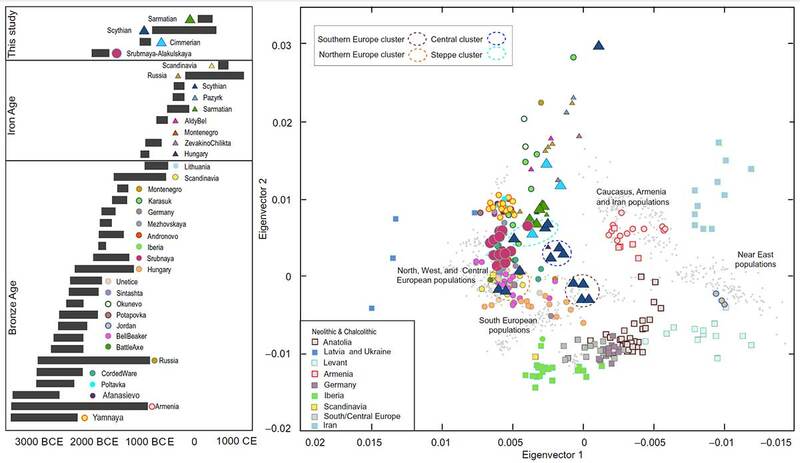 This decline in diversity equally affected the West Eurasian and East Eurasian components of the Tagar mtDNA pool. It should be noted that this decrease can be partially explained by the smaller number of Middle Tagar than Early Tagar samples. Under a simple binomial approximation the mtDNA clusters, observed at frequencies of 6.3% and 11.7%, could be lost by chance in our Early (N = 46) and Middle (N = 24) Tagar samples, respectively. However, the simultaneous lack of several such clusters, with a total frequency in the gene pool of the Early group of 34.8%, is unlikely. The observed reduction in the genetic distance between the Middle Tagar population and other Scythian-like populations of Southern Siberia(Fig 5; S4 Table), in our opinion, is primarily associated with an increase in the role of East Eurasian mtDNA lineages in the gene pool (up to nearly half of the gene pool) and a substantial increase in the joint frequency of haplogroups C and D (from 8.7% in the Early Tagar series to 37.5% in the Middle Tagar series). These features are characteristic of many ancient and modern populations of Southern Siberia and adjacent regions of Central Asia, including the Pazyryk population of the Altai Mountains. We did not obtain strong evidence for an intensification of genetic contact between the population of the Minusinsk basin and the Altai Mountains in the Middle Tagar period compared with the Early Tagar period. Although, several archaeologists have found evidence for the intensification of contact at the level of material culture, namely, a cultural influence of the population of the Altai Mountains (represented by the Pazyryk population) on the population of the Minusinsk basin (the Saragash Tagar group) [6, 71, 72]. Another important issue is the change in the genetic structure of the Tagar population during the transition from the Middle (Saragash) to the Late (Tes`) stage. The Late Tagar stage refers to the Xiongnu period. 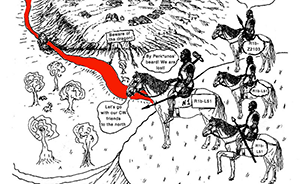 Many archaeologists suggest that the formation of the Tes`stage involved the direct cultural influence of the Xiongnu and/or related groups of nomads from more eastern regions of Central Asia [71, 73]. 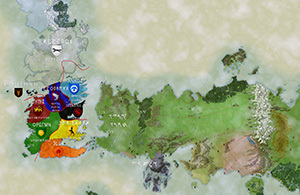 Some archaeologists have even suggested renaming the Tes`stage in the Tes`culture , emphasizing the role of new eastern cultural elements. If this influence also existed at the genetic level, then we would expect to observe new genetic elements in the Tes`gene pool, particularly those of East Eurasian origin. 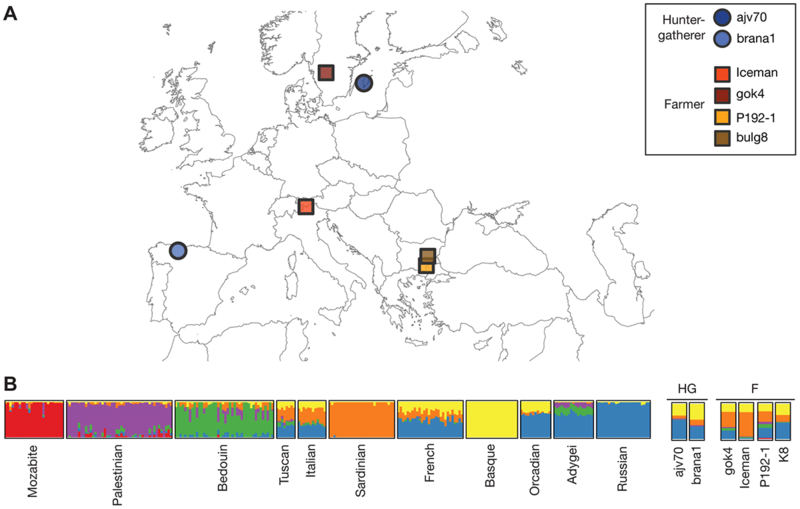 The relevance of ancient DNA data to debates in historical linguistics is an emphatic strand in much recent work on the archaeogenetics of Eurasia, where the discussion has focused heavily on Indo-European (Haak et al. 2015; Narasimhan et al. 2018; de Barros Damgaard et al. 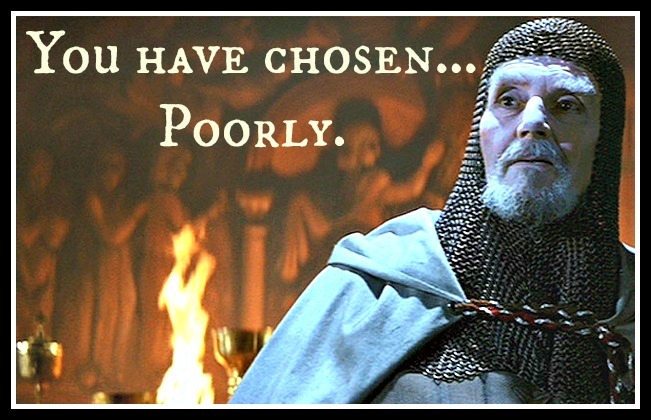 2018a,b). We present new genome-wide ancient DNA data from a historical Siberian individual in relation to Yeniseian, an isolated language “microfamily” (Vajda 2014) that nonetheless sits at the center of numerous controversial proposals in historical linguistics and cultural interaction. Yeniseian’s sole surviving representative is Ket, a critically endangered language fluently spoken by only a few dozen individuals near the Middle Yenisei River of Central Siberia. 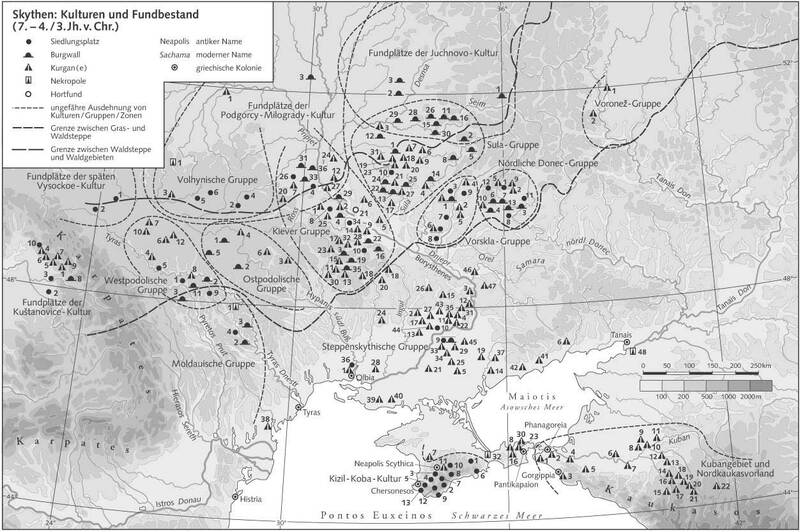 In strong contrast to the present-day picture, river names and argued substrate influences and loanwords in languages outside the current range of Yeniseian, as well as direct records from the Russian colonial period, indicate that speakers of extinct Yeniseian languages had a formerly much broader presence in the taiga of Central Siberia as well as further south in the mountainous Altai-Sayan region – and perhaps even further afield in Inner Asia (Vajda 2010; Gorbachov 2017; Blažek 2016). The consilience of these proposals with genetic data is not straightforward (Flegontov et al. 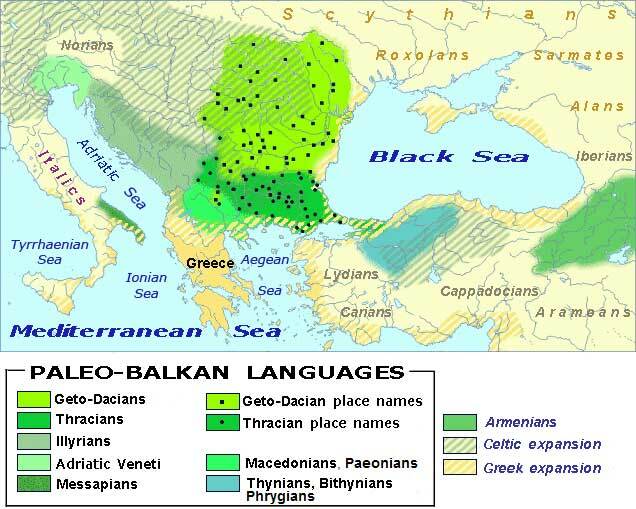 2015, 2017) and faces a major obstacle in the lack of genetic information from verifiable speakers of Yeniseian languages other than the Kets, who have had complex ongoing interactions with speakers of non-Yeniseian languages such as the Samoyedic Selkups. 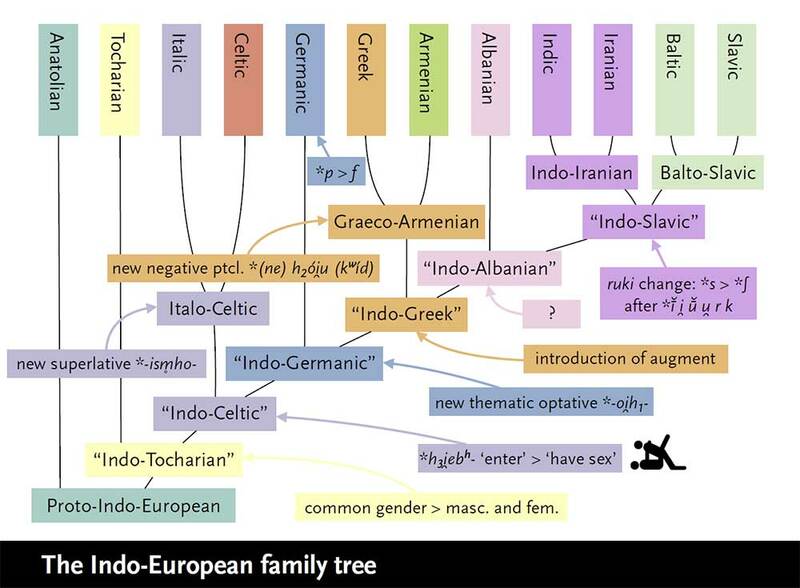 We attempt to remedy this with new historical Siberian aDNA data, orienting our search for common denominators and systematic difference in a broader landscape of concordance, discordance, and uncertainty at the interface of diachronic linguistics and genetics.